Typhoon Kai-Tak has killed at least 27 people as it swept across northern provinces of Vietnam over the weekend, officials have said. Typhoon Kai-Tak made landfall on Friday, bringing intense rain and strong winds. Nearly 12,000 houses were damaged and 56,800 acres (23,000 hectares) of cropland were flooded, officials said. Some of those who died were carried away by floodwaters, one died in a flood-triggered landslide. In the capital, Hanoi, where some 200 large trees were uprooted, one taxi driver was killed when a tree fell on his car. In Bac Giang province a 46-year-old woman died after a hill near her house collapsed in the middle of the night. 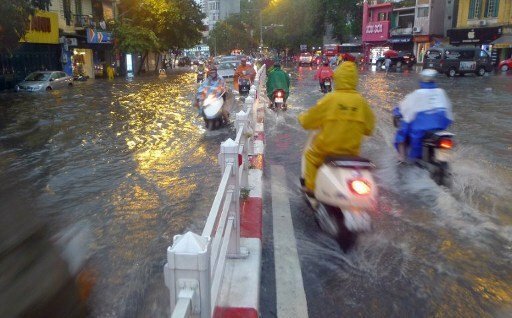 On Sunday, parts of Hanoi remained flooded and residents complained that flash floods still posed a risk despite insistence from the authorities that drainage in the capital had been improved. The Vietnamese army had prepared 20,000 soldiers, along with helicopters, rescue boats and canoes for rescue operations, but only a small number were actually deployed, reports Agence France Presse news agency. China’s Xinhua news agency said that the typhoon had also left two dead and two others missing as it passed across parts of southern China on Friday, destroying some 4,200 homes in Guangdong province.